Click the button below to add the Peri-Peri Hot Sauce to your wish list. Use for marinating and basting chicken, meat and fish. Good with appetizers. 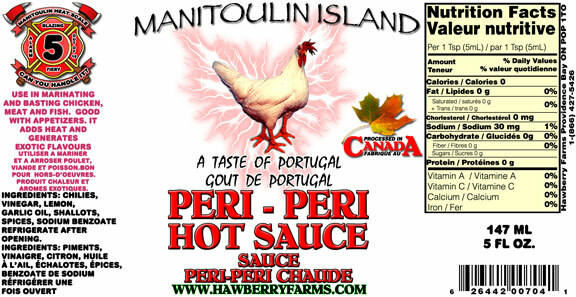 It adds heat and generates exotic flavours. I have been buying this product for several years now, since I discovered it on a trip to South Africa, where it is used widely. My relatives there used it all the time for their "briee" (I think that's how its spelled -- it means "barbicue" in Africaans." I thought it was only available there, but discovered your version at a craft sale in Ottawa, and that it was the same as I had sampled, and have been buying it and using it ever since. My nephew, Tom, loves it, and I buy him some every other year for his Christmas gift. PERI-PERI offers a great kick to any dish.